Every winter, I become less into making oatmeal for breakfast than I had been the previous winter. Truth is – it’s just too time consuming (I know, I know – Ms. Lazy) in the mornings and I end up quickly going back to my granola. The transition to year round granola has urged my need to get creative with the stuff. Eating the same thing ever day? Booooring. And let me tell you…oh my goodness. I can not remember the last time I was this obsessed with a granola. Bringing quinoa into the equation changes everything. 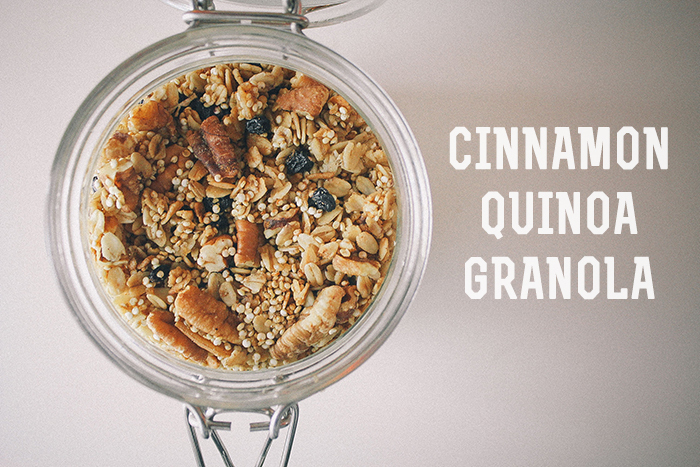 It adds a texture depth that goes beyond anything I’ve experienced in granola. Even if your cinnamon oats end up soggy then you are still left with crunchy and toasted quinoa bits. This recipe can, of course, be adapted to your liking. Add more fruit or spices depending on what you are into. I’ve played around with quinoa dozen of time (see: Southwestern Quinoa Salad, Quinoa Nuggets, or Fall Quinoa Salad) but have never been as excited about it as I am with this recipe. Toasting quinoa? Who would have thought! And the extra protein quinoa brings into this breakfast will help you feel full longer [which means no more 10:45 munchies runs to the vending machine in need of some Cheetos]. Don’t forget to rinse your quinoa SUPER well – you want to make sure all of that bitter outer coating is removed for maximum indulgence potential. This recipes makes about 3 cups so store leftovers in an airtight container. Or be a good friend and share a bag. Or even freeze the stuff if you won’t use it in a timely fashion. 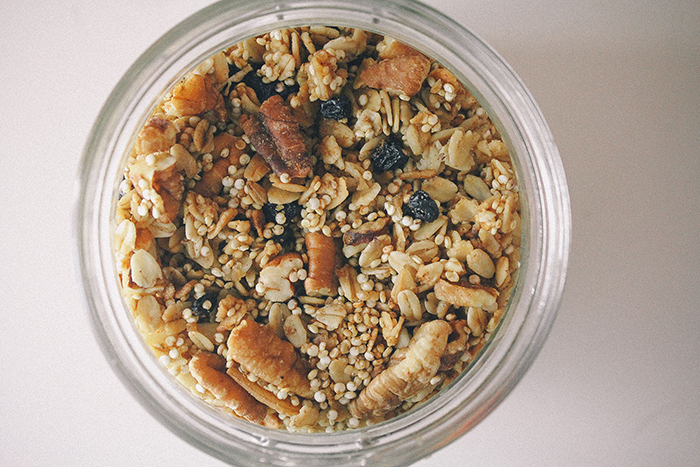 Love granola but hesitant about this quinoa business? Then maybe you should start with this Spiced Pumpkin Granola instead. Preheat oven to 300 degrees. Combine all ingredients in a bowl and spread evenly onto a cookie sheet. Cook for 30 minutes and stir 3 times throughout the cooking process. Remove from oven and let cool completely before moving to an airtight container. Serve over yogurt, milk, or fruit. Or just eat it by the spoonful.